This is Start's third book inspired by photos taken during WWII. In this case it was a propaganda cameraman who spent time with LG2 (later JG77). It was not uncommon for a cameraman and reporter to be with a unit for an extended period of time as their purpose was to document their daily life. 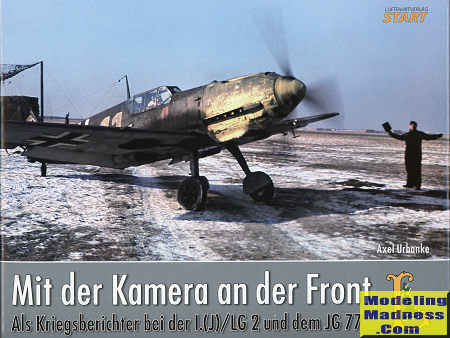 A few more than 60 color images have survived and those were used for the basis for this book that includes many other images to cover the unit's operations from mid 1940 until just into its redesination as JG 77 in early 1942. LG2 was one of those units that did a lot of travelling in the time period covered by this book. Starting on the Channel front it moved to Rumania to participate in the invasion of Yugoslavia and then Greece. They were also tasked with protecting the oil fields at Ploesti and other areas in Rumania. They eventually participated in the invasion of Russia, concentrating on the southern front and Crimea. Interestingly, throughout most of this period, they flew 109Es and mostly E-7s. A goodly number of the photos show these planes without centerline racks so apparently carrying the additional fuel tanks was not the norm. It was only in late 1941/early 1942 that they started getting the F.
A particularly interesting portion of the book covers Gordon Gollub, an ace that generally shunned the camera. Equally of interest are the number of aircraft that arrived wearing desert colors, though most of these planes had been heavily oversprayed with darker colors. In all, it makes for another superlative history/photo book from Start. I learned quite a bit from it and was surprised at some of the findings, yet they are there in the photo record for all to see. The book is written in both German and English, though the maps that are included are only in German. This is a 'must have' book for enthusiasts and modelers alike. Pick up the optional decal sheet as well when you order yours. Review book courtesy of Luftfahrtverlag-Start where you can order your copy.